Online courses have the ability to connect learners and faculty from across the globe. Understanding the role of diversity as it relates to the pedagogical development of courses is crucial for student success. Faculty are responsible for making authentic connections with students and cultivating an inclusive learning environment. Prior research suggests that this may be achieved through culturally responsive teaching. 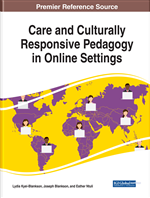 Therefore, the purpose of this chapter is to define culturally responsive teaching, discuss the importance and role of intersectionality considerations, and suggest pedagogical best practices and guidelines. Higher education institutions are focusing efforts to increase enrollments from what appears to be a decreasing number of candidates. Grade Increase: Tracking Distance Education in the United States (Seaman, Allen, & Seaman, 2018) reported 20,928,443 students in higher education in 2012. That number fell by more than 800,000 students (20,124,203) in 2016, with the number of enrolled students dropping each one of those years. While total enrollments have moved downward, there has been an upward trend in regard to distance education numbers. In the same timeframe that overall enrollment has fallen, the number of distance students has progressively increased and as of 2016, Seaman et al. reported that 31.6%, or over 6 million students, were enrolled in at least one distance course. The interest in online courses is strong, as demonstrated by the increase in distance course enrollments for 14 straight years. The contemporary student, often described as having work or family commitments, or one who simply enjoys the convenience that distance learning affords, is quickly becoming the new norm (Vella, Turesky & Hebert, 2016). What is also becoming the new norm in higher education is a different race/ethnic composition of college student bodies. According to the National Center for Education Statistics (NCES, Digest of Educational Statistics: 2016), the number of White students enrolled in postsecondary education fell from 84 percent to 58 percent, while the percentage of Hispanic, Asian/Pacific Islander, and Black college students in the United States has been increasing. From fall 1976 to fall 2015, the percentage of Hispanic students rose from 4 percent to 17 percent of all U.S. residents enrolled in degree-granting postsecondary institutions, and the percentage of Asian/Pacific Islander students rose from 2 percent to 7 percent. The percentage of Black students increased from 10 percent in 1976 to 14 percent in 2015, but the 2015 percentage reflects a decrease since 2011, when Black students made up 15 percent of all enrolled U.S. residents. The percentage of American Indian/Alaska Native students was higher in 2015 (0.8 percent) than in 1976 (0.7 percent). Race/ethnicity is not reported for non-US citizens, who made up 5 percent total enrollment in 2015. Diversity that makes up university classrooms does not consist only of race/ethnicity differences. Instead, military students; lesbian, gay, bisexual, transgender, and questioning (LGBTQ) students; religious minority students; and international students bring forward their own unique cultures, traditions, and norms. To even further complicate the understanding of culture is to consider the complex nature of cultural identities. While there are core characteristics (Irizarry, 2007) believed to be shared by members of cultural groups, experiences can affect their identities, as can where students live, or being multiethnic or multiracial. Irizarry recognizes these forces as possibly creating a hybrid identity.